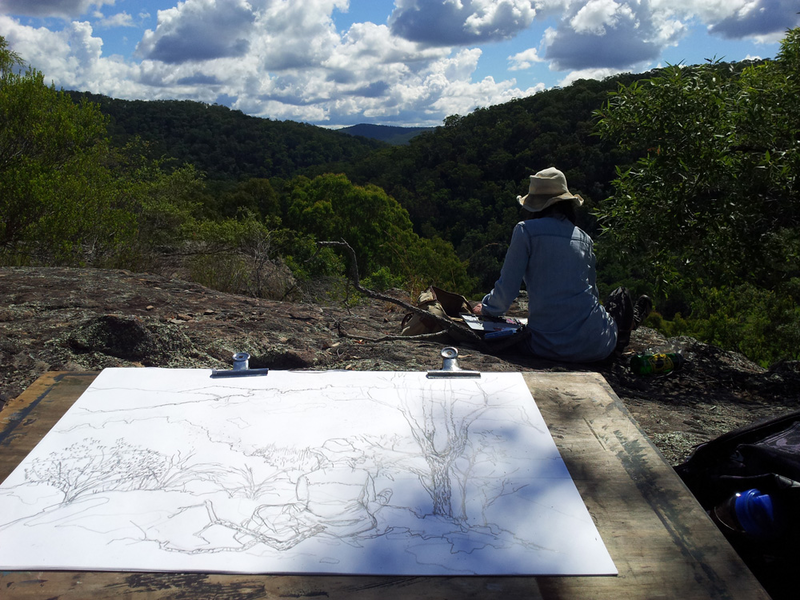 The invitation to indulge and immerse myself in a new landscape, draw & share time with other artistic souls for a weekend was enough to make me burst. Escaping the city on a Friday evening, our winding journey took us deep into the Hunter Valley of NSW, to the quaint village of Wollombi. On arrival in this setting, it did not take me long to realise why this place has now become a renowned artistic epicentre of this region and home to respected Australian artists, such as Paul Selwood; whose property we had the fortune of visiting and drawing at. Our creative hub was a handcrafted, converted barn, perched overlooking an enchanted grove of paperbarks; an aqueous and primeval gem set amongst an emerald field. The infectious warmth and energy of our host, Rena Czaplinska-Archer made for an instant sense of intimacy amongst the group. An all-round Renaissance woman, and deeply inspired by the doctrines of revolutionary dance teacher and choreographer Anna Halprin, Rena’s soul oozes passion; and speaks of her quest to connect body, soul and creative process. Arising at dawn, our days commenced by wandering into our landscape sanctuary and arousing our ‘artist within’ via a sequence of fluid, wriggling motions; effectively loosening up, with the intent to stir up, unprecedented connections between mind, body and our creative selves. From here, it was all stations ‘draw’ as we explored both ourselves and our context as subject matter. At times challenging,as all artistic endeavours can be yet deeply rewarding, I left the valley at the close to the weekend ‘stirred’ with a new appreciation for the importance of engaging one’s entire being in the art of making.